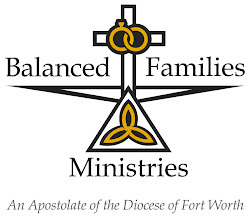 Balanced Families Ministries: "Wake Up!" This morning our priest gave an amazing homily on John’s Gospel about the raising of Lazarus. He paraphrased Christ’s word when he called to Lazarus telling him to come out of the tomb saying, “Wake up!” His message was a plea to his parishioners to get rid of our apathy. Wake up and recognize the state of our country, the state of our families, and the state of our faith. He used a quote from philosopher and historian, Will Durant, which said, “A great civilization is not conquered from without until it has destroyed itself from within.” Why should we care, really? What’s so bad about just hanging out, not worrying about anything or anyone? Because whether we want to believe it or not, there is an eternity we might want to consider. And one final message he gave us is that God isn’t going to banish anyone to Hell. All we have to do is nothing and Hell will come to us. This led me to think about the state of marriage in our world. Sure the divorce rate has actually gone down. But, undeniably, so has the marriage rate. If, by the definition of marriage in the Code of Canon Law, marriage is foremost about the good of the spouses, we surely can see how marriage is beneficial to our Heavenly eternity. The Sacrament of Marriage gives us a partner to help us reach that eternal destination. But, just like everything else, we’re going to get out of it what we put into it. So when we become apathetic, we have someone to inspire us to “Wake up!” Marriage gives us someone to love as Christ taught us to love, actively. Then it inspires us to work together to wake up others. Those of us that are married have to stop being apathetic and “Wake Up!” Changing the definition of marriage is a slap in our faces. Why would we let the government demean what we have by saying it’s not what we have, that it’s only a contractual agreement between people who love each other? No, it’s a sacramental covenant! It has been blessed by God because He’s the one who authored marriage from the get-go; not, the government, not society, not even Oprah! (That’s for those that have been in our classes and heard it before.) So married-folk, stop being apathetic to what is happening right before our eyes. “Wake Up!” and speak up, write, and pray like never before, that we can keep the definition of marriage from becoming something totally foreign to what God designed marriage to be.